Ok, so I want to know how Jude is ready for middle school math. I remember sitting at the kitchen table using crayons as manipulatives to get him to be able to add up to ten. Now he's mastered elementary math and is ready to review a book titled Understanding Pre-Algebra? STOP THE CLOCK. Mama is so not ready for this. Understanding Pre-Algebra is a full-course worktext style math offering from The Critical Thinking Co.™ This is a standards-based program for students in grades 6 through 8. However, what makes it different is its organization. Unlike many other programs that just teach how to get the answer, this text stresses critical thinking about the problem's process. Rather than just learning the steps for how to get from problem to solution, Understanding Pre-Algebra teaches the student to think about the choice of steps and why he's using those strategies. This "learn why, not just how" is why I like programs from The Critical Thinking Co.™ We've used so many things from their line up. In the past, we've reviewed their Sentence Diagramming book (I'm very happy to have that still on my shelf for when Celia begins homeschooling later this month! ), as well as Pattern Explorer, another math program. We've even branched out and used several other items: Matthew has worked with their Critical Thinking and US History curricula, and Jude and Damien completed grade-appropriate levels of Mathematical Reasoning this past school year. This company is a favorite here! I am not a math person, and I freely admit it. I survived high school Algebra by the grace of God and the unwavering patience of and tutoring by a dear friend. He now holds a Ph.D. in math and is a college math professor; clearly, he completely gets math. For whatever reason, the rules of Algebra just did not click for me. My last homeschool forays into Algebra were with kids who came with Pre-Algebra "already installed." Matthew started with Algebra I, while Luke had already completed Algebra I. Their further higher-level maths have been self-contained, online courses because I've always felt it would be better to have people who specialize in math teach them, the same as if they had gone to a brick-and-mortar high school. I have been grateful to hold my own through elementary maths with the boys. Teaching a higher math is new territory for me. I took a deep breath and dove in. I mostly understand Whole numbers when you're talking "How many slices does this cake make?" I know numbers are a Real pain and think all math is Irrational. Already, I fear I'm over my head -- how can I explain what I don't understand? Ah, but here's were "learn why, not just how" makes the difference. The way number groups are presented is in a logical fashion. They start with Natural numbers. They're the ones that come "naturally" to kids...1, 2, 3. Next come the Whole numbers...the Natural numbers plus the number 0. Then it adds Integers...which is really just all the numbers you know so far AND their opposite. It made sense to Jude, and it made sense to me. I was getting excited -- I've made it through page 1, and I think I get it. Yes, I was doing the happy dance in the living room. Page 2 explains Odds, Evens, and Prime numbers -- all familiar concepts to me. Jude struggled a little bit, however. I think it was because his regular math program explained these in a slightly different manner, and he couldn't quite reconcile that they were the "same idea, different words." As a non-mathy person, I really appreciate when it clearly writes out things that you need to know. (Did my school textbooks do this? I have no idea.) I think we will be copying this to hang up as well, as a checklist to refer to until the process becomes ingrained. I wonder if I had thought to copy this order and keep it in front of me (rather than trying to simultaneously memorize and work with it) if later concepts would have come more easily? Chalk one up for second chances. I'm impressed with the content. I feel that a person who is not naturally mathematically inclined will be able to master the topics and build a strong foundation for higher maths. However, I don't think we are going to switch and use this for Jude's main math program, for several reasons. First, this is a text-only book. It is a lot of reading and trying to comprehend, and Jude is a very auditory or kinesthetic kind of learner. This is a book that he struggles to do independently -- he often needs me to read things aloud so he can focus on the content, not decoding. In what we have accomplished, there was only one non-reading based activity - creating integer dice and practicing adding positive and negative integers. I also think it teaches very quickly. This book is 367 instructional pages, including an eight-page final exam. Students need to average a lesson a day to complete the book in a typical 180-instructional day year. However, each lesson has 20 to 30 problems for each lesson. I think this quantity of problems is a good number to master a concept, but this book is asking him to do as many as 30 problems in a single day. I think it's too much "all at once" -- he seems to get overwhelmed, and I wind up having to sit with him and refocus him frequently. I would rather do the lesson plus three 10-problem practice days to allow time for the ideas to sink in, rather than what feels like hour-long cram sessions. However, to keep to the "year-long" schedule, slowing down isn't an option. If I were going to use this book as my primary teaching option, I would slow it down and take closer to 18 months to complete the course. I think if you had a younger child, like Jude, who is just entering middle school at an advanced math level, it might be a good way to help him "slow down" his pace by taking the time to build a solid foundation for Algebra, Geometry, etc. Even if it took Jude two years to complete Pre-Algebra, he'd still start Algebra 1 in 8th grade. If you had an 8th grader who needs to do Pre-Algebra to get to high school maths, I'd be hesitant that it would be too much, too fast and leave him floundering through the levels that build upon these skills. There also is no cumulative review. The final exam after Chapter 15 includes questions from Chapter 1, but there is no real opportunity to practice Chapter 1 information once you move on to Chapter 2. You'd have to make up your own review/enrichment/practice pages. We are going to go back and use Jude's regular math program to teach Pre-Algebra. However, we will continue to use this one for extra practice; since my original plan to have him work on the next level of Math Reasoning, we will just stay with this instead. I think it's good that he is being asked to explain WHY he's choosing to answer in a particular way. Figuring out where a hypothetical student went wrong will hopefully help him be more mindful and avoid them himself. These are something that his usual program doesn't ask him to do, and I think something he would greatly benefit from practicing. As a person who has learned this stuff before (a VERY long time ago) and still suffers from sweaty palms when it's time to use what I should know, it is an excellent review of concepts and practice. I wouldn't go so far as to say I love algebraic concepts, but I think this book has helped negotiate a truce. 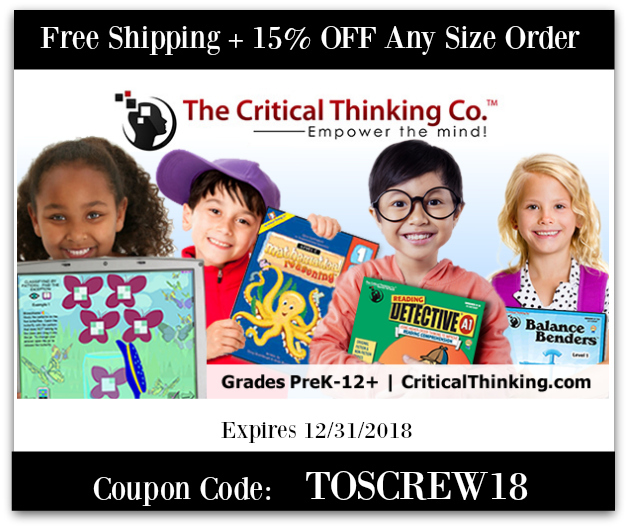 Crew families have been working with several products from The Critical Thinking Co.™ Click on the banner below to see what others thought of both Pre-Algebra and the other programs! Labels: 2018 Schoolhouse Crew Reviews, curriculum, high school, math, middle school, The Critical Thinking Co.